It’s now time to start a new series of drawing guides, with Disney characters in the spotlights. And today it’s time for yours truly: Donald Duck. That’s right, we are going to learn how to draw Donald Duck. Now, before starting the guides, we must add that Donald always wears a blue sailor suit and a tiny cap on his head. OK, get your pen and paper ready cause we’re starting. First we have a 4 steps guide (from here) and then some videos from the pros. Step 1: Start by sketching a circle with a cross inside. These will act as guidelines for Donald’s face elements. Now draw his eyes like in the picture. Draw Donald’s upper and the lower bill that curves beneath the circle. Don’t forget his tongue. Sketch the eyebrows and the rest of his head. Step 2: Since we are only drawing Donald’s head in this guide, the hardest elements were contained in the first step. Now we have to draw his cap like in the second picture. Also, don’t forget the caps back ribbon. Step 4: Finally, add some colours to your sketch. Et voila, you Donald is ready. That’s about it. Hope you’ve learned a little bit about drawing Donald. And stay tuned, cause more guides with Mickey, Daisy, Goofy and other Disney characters will come. Please subscribe to my feed or subscribe to the newsletter if you want to stay in touch with the latest drawing tips, guides and videos. 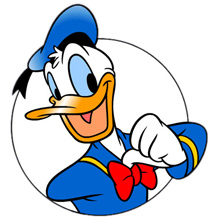 5 Responses for "Learn how to draw Donald Duck"
Leave a reply on "Learn how to draw Donald Duck"